1996: Pacific Gas and Electric Company (PG&E) entered into a voluntary agreement with the Department of Toxic Substances Control (DTSC)The department within the California Environmental Protection Agency in charge of the regulation of hazardous waste from generation to final disposal. DTSC oversees the investigation and cleanup of hazardous waste sites., a part of the California Environmental Protection Agency (Cal/EPA), to investigate the nature and extent and to clean up any contamination resulting from Topock Compressor Station (Station) operations. This agreement, the Corrective Action Consent Agreement (CACA)A voluntary agreement between a lead agency and responsible party in which the company commits to investigate the nature and extent of contamination at and surrounding a site governed by RCRA, and to take corrective action., proscribes that PG&E follows an investigation and cleanup process governed by a federal law known as the Resource Conservation and Recovery Act (RCRA)A 1976 amendment to the first federal solid waste legislation, the Solid Waste Disposal Act of 1965. In RCRA, Congress established initial directives and guidelines for U.S. EPA to regulate and manage solid waste, including hazardous waste. RCRA established a regulatory system to track hazardous substances from the time of generation to final disposal. The law requires safe and secure procedures to be used in treating, transporting, storing and disposing of hazardous wastes. RCRA was designed to prevent new, uncontrolled hazardous waste sites..
1989: PG&E replaced the original single-lined evaporation ponds with double-lined ponds at a new location, and the original ponds were removed and closed. 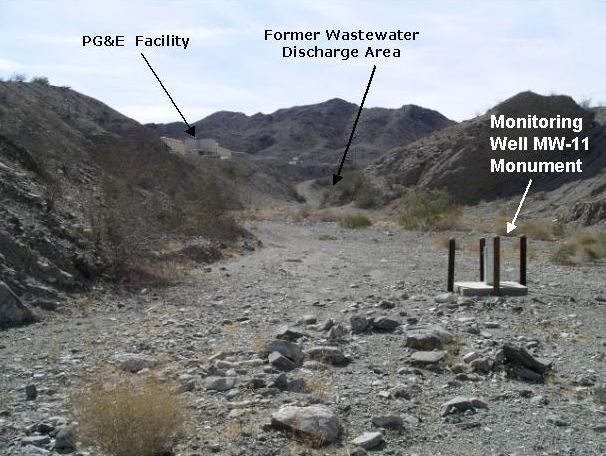 PG&E's disposal of wastewater from ongoing operations is regulated by the Colorado River Basin Regional Water Quality Control Board (Water Board), a board of the Cal/EPA. 1985: PG&E replaced the chromium-based additive with a phosphate-based solution. 1974: PG&E began disposal of all wastewater exclusively in the lined ponds. 1971-1974: PG&E alternated disposal of the treated wastewater between the injection well and the lined ponds. 1971: PG&E installed a series of lined evaporation ponds to receive treated wastewater. 1970: PG&E installed an underground injection well to receive treated wastewater. 1964: PG&E began treating the wastewater to remove hexavalent chromium prior to disposal. 1951-1968: Cooling tower wastewater was discharged into percolation bedsAn unlined bed with built-up sides constructed of soil that collects discharged wastewater and allows it to soak into the ground and/or evaporate. in a dry wash area next to the Station (see Bat Cave Wash photo below). 1951-1985: Hexavalent ChromiumHexavalent chromium is a form of chromium. Chromium is a metal naturally found in rocks, soil, and the tissue of plants and animals. Hexavalent chromium can be found naturally at low concentrations, but it is also used in industrial products and processes and is a known carcinogen. On May 28, 2014, the California Department of Public Health adopted a new California drinking water standard at 10 parts per billion for hexavalent chromium. was used at the Station to prevent rust in its cooling towers. 1951: The Station began operation.